Most of the mirroring programs give you the ability to remotely control your computer from Android or iOS devices. This feature is undeniably useful as it allows you to change settings on your PC or manage your presentation without using the mouse and keyboard. 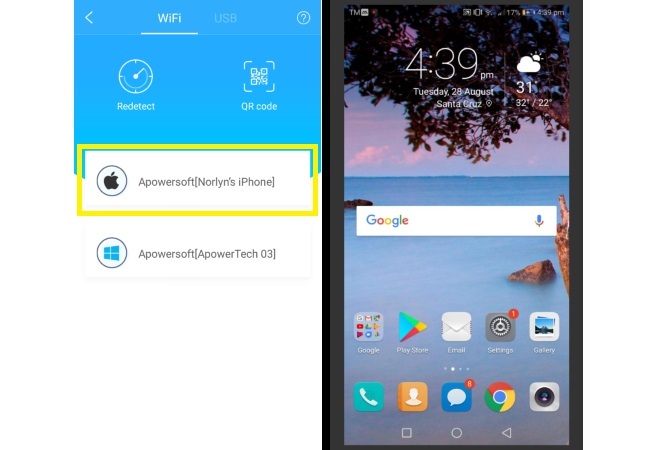 However, very few of them offer the function to connect Android to iPhone which can be beneficial in some cases. For instance, you want someone else to look at your phone but you don’t want to give it to him. To avoid looking rude, you can control Android from iPhone by using the following application listed below. TeamViewer has continuously provided its users a reliable instrument in controlling their computer remotely. With the goal to help individuals connect their device, the company developed an application that will cater mobile phones. This particular app is free to download and it is compatible with your Android 4.0 or up and Apple devices running iOS 9.0 or later. Aside from mirroring your Android to iPhone, it is also capable of controlling your mirrored device from your receiver. So instead of holding your Android, you can just access your iPhone’s touchscreen for navigation. There is also a built-in keyboard which allows you to type text from your iDevice. Now let’s begin to control Android device from iPhone. 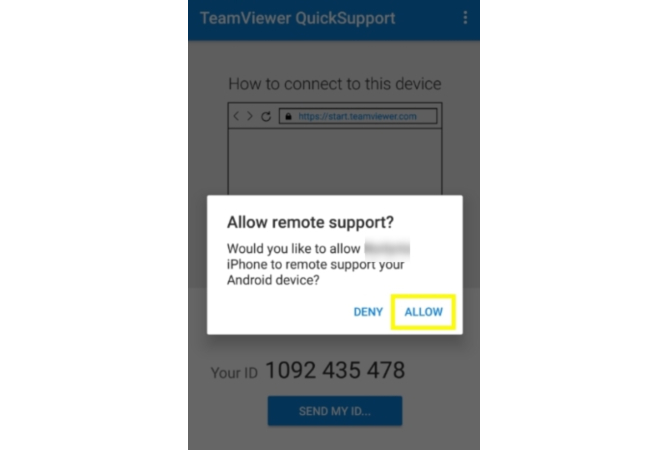 Download TeamViewer: Remote Control from the App Store on your iPhone and download TeamViewer QuickSupport on your Android. From your Android device, you will see a unique ID. 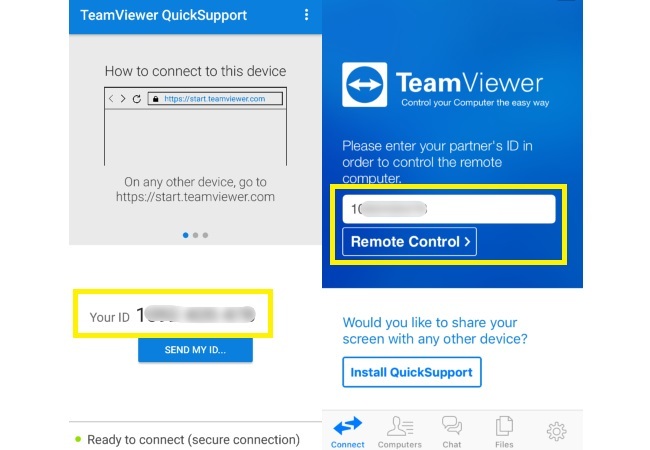 Simply copy it on the TeamViewer app of your iPhone and click “Remote Control”. Hit “Allow” on your Android phone when prompted and wait for the app to establish the connection. In case you are unable to successfully connect your devices, just repeat the process until your iOS device recognizes your phone. Once connected, you can begin to control Android from iPhone. To activate the keyboard, click the arrow up symbol located at the lower left corner of your screen and hit the keyboard icon. 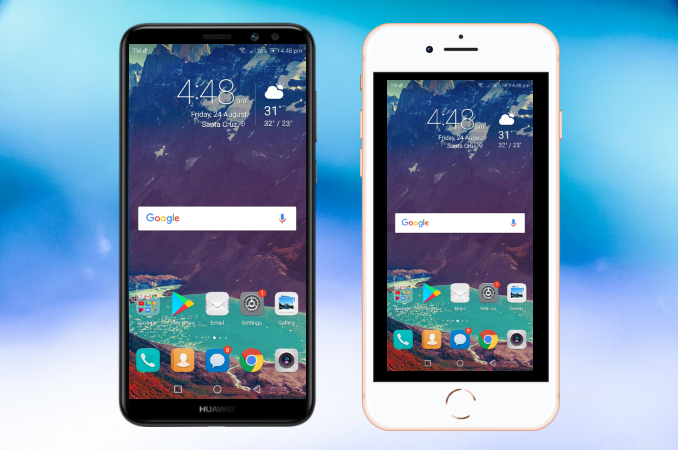 By following these simple steps, you’ll be able to cast Android screen to iPhone. Though it does not ask for payment, you might get annoyed because the performance of the app depends on your internet connection. So in case you have a slow connection, there will be a lag between your Android and iPhone. To avoid this, you can adjust your settings and choose if you want to optimize the quality or speed of the devices. To start, download and install ApowerMirror on your Android and iOS device. Next, make sure that both are connected on the same network. Launch ApowerMirror on your devices and tap the M blue button on your Android to enter detection mode. 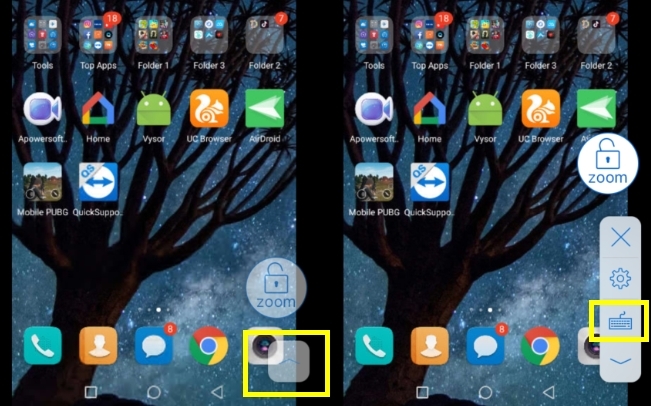 Once your iPhone appeared on the list, tap on it and your Android screen will be automatically mirrored. Amidst the rapid development on mobile tech software, connecting an Android device and iPhone is still not yet ventured in. For the meantime, you may rely on TeamViewer to control your Android screen from an iOS device and ApowerMirror to cast your screen from a different phone.